GRAND CHUTE, WI - The Wisconsin Timber Rattlers season begins on April 4 and there are numerous ways to follow the Midwest League affiliate of the Milwaukee Brewers this season! WCWF (CW 14) in Green Bay and WVTV-2 (My24) in Milwaukee will televise fifteen Wisconsin home games this season. All 140 regular season games are available on the radio with AM1280, WNAM, the long-time radio home of the team, and on the TuneIn app. Every Wisconsin home game and 45 of their road games can be watched online with a subscription to MiLB.TV. "We are excited to provide our passionate fan base with multiple ways to follow the team this season through radio, television and online streaming. Every game, home and away, will be available on the flagship of the Timber Rattlers, AM1280, WNAM and through our TuneIn radio app," said Timber Rattlers president Rob Zerjav. "We are also pleased to continue our great relationship with CW14 and My24 to televise all of our weekend home games beginning in May. Lastly, we are improving our online streaming to feature an upgraded HD picture and fans can see all Timber Rattlers home games as well as over half of the road games through MiLB.tv." 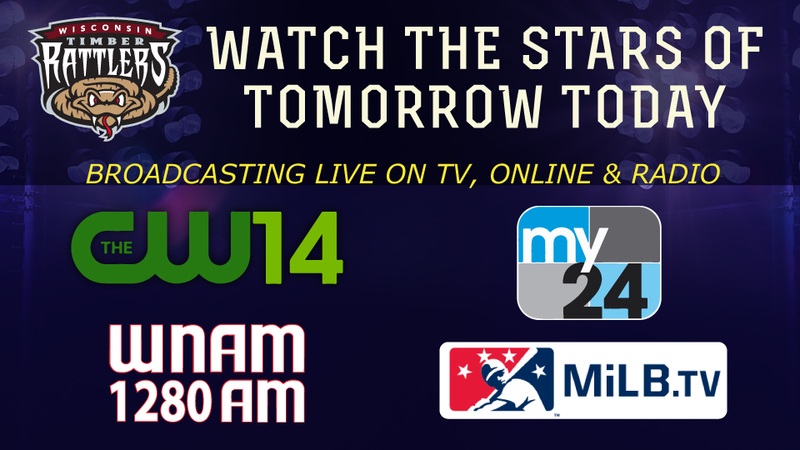 Television coverage of Timber Rattlers games starts on Saturday, May 11 on WCWF (CW 14) in Northeastern Wisconsin and WVTV-2 (My24) in Southeastern Wisconsin. Both stations are available in their respective viewing areas on all cable platforms and free over the air. "As a proud supporter of high quality local sports, we are excited to partner with the Timber Rattlers again in 2019," said Jay Zollar, general manager of WLUK and WCWF. "Each year they offer a terrific baseball experience whether at the park or on television and summer weekend television gets better with the addition of the Timber Rattlers on CW 14." Timber Rattlers broadcaster Chris Mehring will be in the broadcast booth for his twentieth season of Timber Rattlers baseball. All regular season games - and any possible playoff games - can be heard on AM1280, WNAM during 2019. Radio broadcasts will start with the pregame show 20 minutes before the first pitch. If you are not near a radio or outside the extensive WNAM listening area, the radio broadcast can also be heard on the TuneIn radio app. 'Hear every pitch and run on air, online, or on the free WNAM Mobile App," said Steve Edwards, WNAM program director. "The excitement of Wisconsin Timber Rattlers baseball is found on America's Best Music, 1280 WNAM!" A subscription to MiLB.TV provides the stream for all 70 Wisconsin Timber Rattlers home games and road games at Kane County, Quad Cities, Cedar Rapids, Peoria, Dayton, Lansing, and Great Lakes. Fans can also follow other Brewers minor league affiliates - Rocky Mountain, Carolina, Biloxi, and San Antonio - with a subscription. Timber Rattlers fans may receive a discount on the $49.99 price for the season by ordering MiLB.tv at this link and using promo code "TIMBERRATTLERS". The schedule for the 2019 Wisconsin Timber Rattlers season is available here. Fans may purchase full season, half season, seven-game to ten-game packages, or group outings for the season through the Timber Rattlers Ticket Office at Neuroscience Group Field at Fox Cities Stadium by calling (800) WI-TIMBER or (920) 733-4152; stopping at the Ticket Office; or online through timberrattlers.com. Individual game tickets for 2019 are on sale now! Ticket Office hours are Monday through Friday from 9:00am to 5:00pm and Saturdays from 10:00am to 3:00pm.